Sure, I know why you’re here. You want to know what happened on April 29, 2015 – long before you were born – and how one game of baseball changed everything. We knew the game on April 29 would be historic before it even started. We just had no idea how historic it would be. And, how it would turn baseball on its head. The Baltimore Orioles and Chicago White Sox played to an empty stadium that day. It was the first time that no fans attended a major league game. Baltimore was in turmoil (probably similar to the unrest and turmoil you have in your own cities, as some things, sadly, don’t ever seem to change). For the safety of the community, the game was closed to the public. Let me clear up a few things. This game was seen by more people than would ordinarily watch an April baseball game on a Tuesday afternoon by two teams hovering around .500. O’s catcher Caleb Joseph having fun with imaginary fans. People stood outside the ballpark peering through the gates or rented $300 suites at a nearby hotel to look down on the field. But, little did we know that the game would set into motion the greatest sea-change in 21st-century baseball – the end of fans in the bleachers. I know this may sound strange (unsettling maybe, eerie, perhaps), but up until April 29, we fans thought we were indispensible. We cheered and chanted and carried on at games. We were certain that our cheers and boos could make a difference. We were the 10th man. Except we weren’t. On April 29, we learned the truth. We were as disposable as a bag of stale sunflower seeds. The game itself was pretty much like any other game. The Orioles got off to such a fast 6-0 start in the first inning that I tweeted this. Lots of O’s fans retweeted me. Because it was so, well, ridiculous. The Orioles went on to win 8-2. Their usually unsettled starter Ubaldo Jimenez was eerily settled and dominating. He wouldn’t admit it, but our absence hadn’t made a difference. They hadn’t even noticed we were gone. 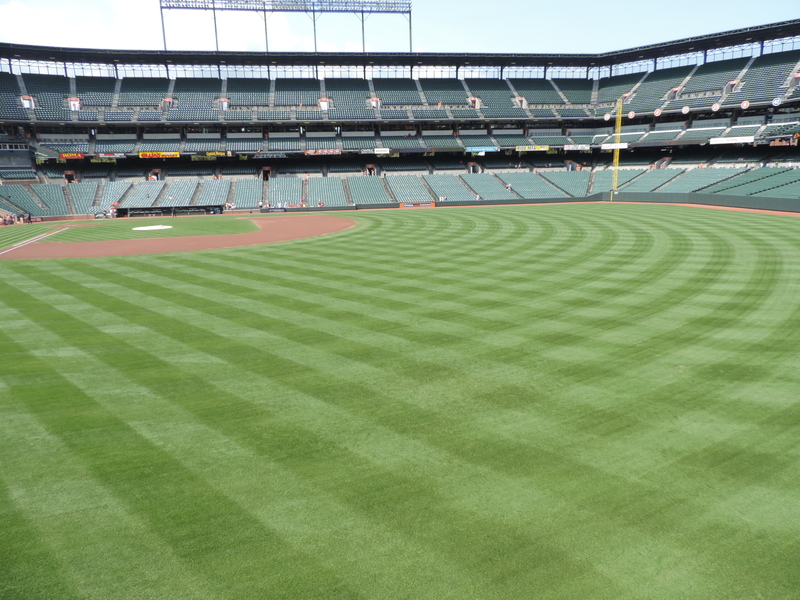 O’s first baseman Chris Davis tosses a ball … to no one. 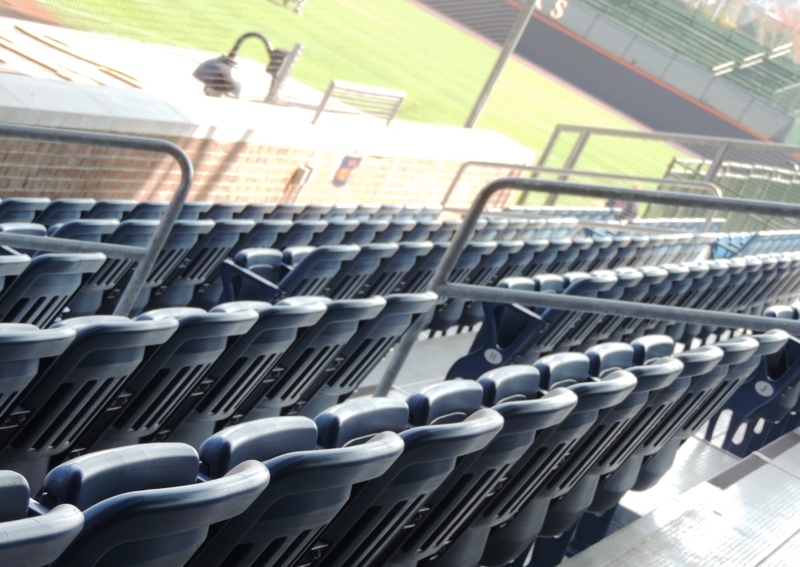 As the 2015 season began, one of the big stories was how baseball needed to speed up its games. The average game in 2014 ran just over three hours. The game without fans? Two hours and three minutes. An hour faster. Come to find out, we were the slow pokes. Once owners and their accountants realized that they could play speedy games without fans and still turn a profit, our days were numbered. We were downsized until we were gone. And, that dear Future Person, is why there are no fans at your baseball games. Oh sure, the luxury suites are still there. Those were too lucrative to lose. 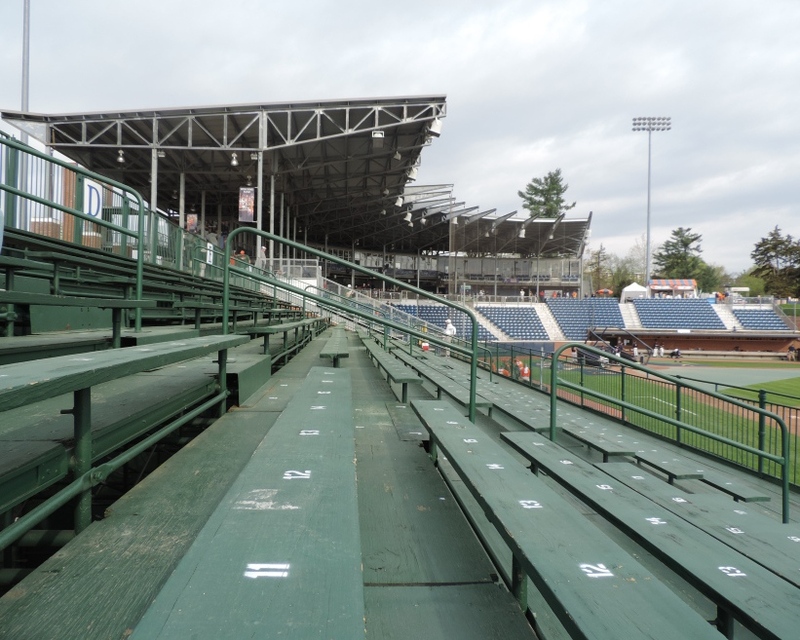 But, no bleachers, no upper tiers, no lower tiers. Just wide open empty space where foul balls and home runs collect like dust bunnies under a bed. Without us there are no piles of peanut shells and spilled beer to clean up. No drunk fights to break up. No fan, walloped with a foul ball he didn’t see coming, to bandage up. We were more trouble than we were worth. Future Person, you’ll never know how wonderful it is to gather up the family and spread out at a game. To fill up on peanuts and popcorn and French fries and cotton candy (do you even know what cotton candy is?). To yell at the umpires, cheer the mascot races, root for the home team, and heckle the other guy’s outfielders. To soak in the summer heat or, even better, the chill of October, from awesome seats on the first-base side. To catch a foul ball or a home run. I’m glad you still have baseball, even if you must watch games from the safety of your techno-televisiony-hologram devices. At least you have something. And, I’m glad that scientists figured out a way to ensure that Vin Scully still calls Dodger games, extending his baseball career for hundreds of years to come. Oh, and I almost forgot, I’m glad you finally brought the DH to the National League. It shouldn’t have taken so long, but the National League can be stubborn sometimes, so really, good for you. But, I’m sorry about the empty games. There’s not much time left for fans, I guess. I hope we make the most of it. This entry was posted in Baltimore Orioles, Baseball and tagged Baltimore, Baseball Fans by Jackie, The Baseball Bloggess. Bookmark the permalink. This is one bit of history I hope never repeats itself. I enjoyed Showalter’s thoughtful comments. Do you think Ubaldo’s W/L record would improve if he wore earplugs to recreate the “eerie” experience when he’s the starter? Buck has been wonderful throughout this difficult time in Baltimore — and always tempers his comments by reminding people he can talk about baseball, but it’s not appropriate for him to comment on things beyond his expertise. A good reminder for all of us! I have been waiting for the authoritative commentary on the game. I could only find it from one person. Everything else I’ve read on this sad affair fell far short of the mark. You always get it right, Jackie. Thanks, Bruce. I kept wanting to say more about all that happened in Baltimore during these past weeks. It’s such a difficult situation and one that has broken my heart. Ultimately, though, I took the simpler road and, abiding by Buck Showalter’s reminder to take care when talking about things beyond our scope of understanding … I decided to stick to baseball. You did a great job with this blog post. (I showed it to someone else and he agreed.) Maybe there’s another word or two you’ll have on the matter someday.